The scope of the Educational Technology and e - Learning department is the development and application of new methods and tools, based on modern learning theories and instruction techniques, which create an enhanced learning environment and provide integrated teaching solutions. The utilization of Information and Communication Technologies (ICT) provide the appropriate means to overcome learning obstacles inherent in traditional lecturing as well as to encourage productive efforts to solve problems and rekindle knowledge. With the use of network based multimedia applications the Laboratory aims to consolidate all the technological and pedagogic prerequisites, which appoint technology as a useful tool for the dissemination of information and the management of knowledge. By organizing seminars addressed to teachers, students and business executives, the Laboratory aims to highlight the catalytic role of ICT in the dilation of knowledge and enterprise activities. The research efforts of the Laboratory are also focused on the application of pilot educational programs aiming at the adoption of innovative teaching methods that will transform the structure of pedagogic relationship between lecturers and students. Emphasis is given in the development and application of educational software based on templates oriented towards the exploration of "micro-worlds" and the design of educational material, which is based on internationally acclaimed and pedagogically valid educational software. The investment made in the area of electronically supported learning (e-learning) and Adaptive Educational Hypermedia Systems enables the Laboratory to offer lectures and advance the dissemination of knowledge in the form of a virtual university, to promote the development of learning communities and to support the lifelong education. The provision of digital learning services includes asynchronous (storage of educational material) as well as synchronous methods (teleconference and optional interaction with the flow of the lecture and the class). The laboratory participates in European Programs of e-Learning that aim in the production of software tools for synchronous distance learning (online tele-education), which will combine pedagogic virtue and low operational cost. 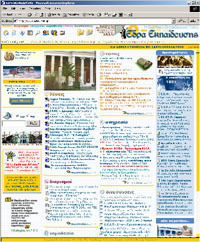 Among the Laboratory's activities is included the support of the Educational Portal "Έδρα Εκπαίδευσης (Educational Workbench)" (http://www.edra.ipet.gr) that provides information on educational subjects with daily updates of both printed and electronic press, publication of school activities seminars, conferences and official documents. In the future it is scheduled to expand to an Internet site that will provide also educational material. The materialization of the laboratory goals is achieved with the close cooperation of the Multimedia Unit, which provides modern equipment (digital scanners, 3D scanners, reading units, high definition digital cameras, digital recording and reproduction sound systems) and conducts research on methods for managing sound and video (streaming or compressed video, digital image processing). The Network Operation Center of the Institute also, offers to the Laboratory access to specialized application development software and a high-speed network infra-structure. The Laboratory facilities include an experimental teleconference room for the comparative testing and evaluation of related software and for the educational assessment of methods for distance learning. 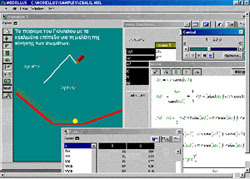 The electronic library of the Laboratory is continuously updated with national and international educational software and multimedia applications. The Laboratory appoints the prerequisite computer infrastructure and experienced personnel for the evaluation and certification of educational software. The development of consortiums in the national and international level secures the exchange of technological knowledge and the undertaking of actions that promote the research in the fields of Education and Culture.